Sometimes, when tasks and schedules get overwhelming, it’s helpful to make a to-do list to make things feel more manageable and focused. If your children’s behavior problems have you feeling overwhelmed and not knowing what to do first – no worries, we’ve got you covered! 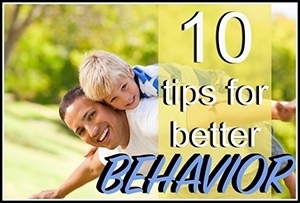 Start with these 10 tips for better behavior. 1. Invest in one-on-one time with kids daily. By far, the best thing you can do to improve your children’s behavior is spending time with them individually every day, giving them the positive attention and emotional connection they’re hard-wired to need. When they don’t have that positive attention, they will seek out attention in negative ways, and consequences and other discipline methods won’t work. Aim for 10-15 minutes a day per child and you’ll see measurable improvement almost immediately. 2. Get serious about sleep. Think of how you feel when you’re overtired – cranky, irritable, your head and stomach hurt. It’s the same for kids, and most toddlers up to teens get far less sleep than their growing bodies need. Teens even need more sleep than some younger kids – so consult your family physician about the hours of sleep your kids need by age. If your child has a sleep deficit, try moving up bedtime by 10 minutes every few nights. A well-rested kid is a well-behaved kid and can function better throughout the day, including school. 3. Focus on routines. Kids thrive with a routine, so set clearly defined routines for the most challenging times of the day, like mornings, after school, mealtimes and bedtimes. Let your kids help decide how the routine will go (do we get dressed or brush teeth first? How can you help get dinner ready?) For younger kids, write out the order of the routine using pictures or words and let them decorate it, then hang it where they’ll see it every day. Then stick to it. 4. Everyone pitches in. For better behavior, kids need to understand that everyone needs to contribute to make a household run smoothly. All kids, from toddlers to teens, should have “family contributions” (not “chores!”) they do daily – this helps bring your family closer together, teaches them life skills and works to prevent the entitlement epidemic. 5. Encourage your kids to be problem solvers. Time to retire your referee whistle – when parents step in the middle of a sibling disagreement and determine who’s at fault and dole out punishments, it actually makes things worse. To kids, they see a winner and a loser and a need to escalate the sibling rivalry. Encourage your kids to find a resolution to the problem on their own, which will help them solve conflicts as they grow older. If you have to get involved, don’t choose sides, but ask questions that will help them figure out a solution that all parties can feel good about. 6. Simplify family rules and be firm. It can be difficult for kids to keep a mess of rules straight. If it seems like you have 50 or so family rules, whittle down the list to what’s most important. Determine a consequence for each rule, make it clear to kids ahead of time of both the rules and consequences, and don’t give in. To make sure your consequences follow the 5 R’s of Fair & Effective Consequences, join Amy McCready for an upcoming training webinar. 7. Send time-out to the sidelines. Practically every parent has tried to punish or correct behavior by sending their child to “time out,” but most have found it just doesn’t work or lead to better behavior. That’s because a time out in the corner or bedroom doesn’t teach kids how to make better choices the next time, and generally, a time out just escalates a power struggle. Kids, especially the strong-willed, will push back, and hard. Instead, focus on training, not punishment. Ask, “What can we do differently next time?” and role play the do-over. 8. Just say no – to saying no. Kids barrage us with questions everyday, and more often than not, our answer is “no,” and kids resent it. Find opportunities to say “yes” when you can. If your daughter asks to go to the indoor pool in the middle of a busy weekday, try saying, “Going to the pool sounds like so much fun. Should we go tomorrow after school or on Saturday?” Of course, there will always be things that will need a big “no,” but try to redirect them to a more positive option. 9. Don’t worry, be happy. Be the example you want your kids to see. Think about how your kids might describe you to their friends – would they say you’re fun and lighthearted, or that you’re stressed and bossy? Try changing your energy by simply smiling more. It will help you keep calmer in times of stress, and your kids will notice and keep their behavior more positive, too. 10. Don’t ignore the source of misbehavior. Misbehavior is always a symptom of a deeper issue, and when we can find what causes it, we can use the right strategies to correct it. If Bella keeps dumping toys all over your desk, is she upset that you’ve been working all afternoon? Is Eli throwing a fit over having the blue plate because he really wanted to make a choice and feel independent? In the midst of misbehavior, stay calm and ask yourself what might be causing it. Cut through the chaos by following these 10 tips, and you’ll start seeing better behavior from your kids and you can start creating a happier, more peaceful home. Want MORE strategies for better behavior? It will be the best hour you spend all month! Click here to find a date and time that suits your busy schedule.